On April 12th 2019 BDVA releases a Position Paper called "Towards a European Data Sharing Space: Enabling data exchange and unlocking AI potential". The successful development and adoption of a pan-European data sharing space will mark a milestone in the evolution of the new data economy. The envisaged macro-level space can incorporate existing vertical, cross-sectoral, personal and industrial data spaces, offering services and experimentation opportunities to all stakeholders. It also needs to adhere to and promote European values, e.g., democracy, privacy safeguards and equal opportunities. These values can become the trademark of European data economy technologies, products and practices. Find the paper here. BDVA i-Spaces call for labels 2019 is open! The BDVA i-Spaces group has launched the call for Data Innovation Spaces labelling 2019. The call is open to any data innovation space or hub in Europe. The BDVA i-Space label recognizes that those initiatives meet the necessary requirements to boost data driven and AI based innovation at local level, and to establish collaborations with similar initiatives to foster the adoption at European level. All the information needed to apply can be found here. Deadline: 31st May 2019. Read more about BDVA i-Spaces call for labels 2019 is open! The European Commission is taking forward its work on ethics guidelines on Aritificial Intelligence. The industry, research institutes and public authorities are invited to test the detailed assessment list drafted by the High-Level Expert Group. On the 29th of March 2019, the BDVA General Assembly officially welcomed 7 new members: Inlecom Group BVBA (Belgium), IT4Innovations (Czech Republic), Tampere University (Finland) joined BDVA as FULL member. GESIS - Leibniz-Institute for the Social Sciences (Germany), Obuda University (Hungary), Prizztech Ltd. Robocoast (Finland), and Solver Machine Learning, S.L. (Spain). 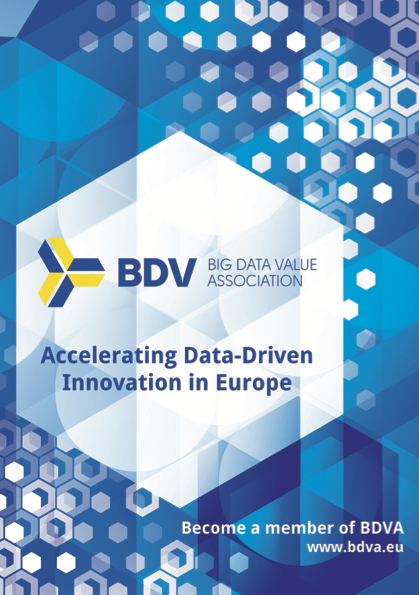 New BDVe series webinar: How much do you know about the European Strategy on Big Data? New BDVe webinar (April 9th, 12:00 CEST) to discover new insights about the European Strategy on Big Data. With Nuria de Lama, Member of the Board of Directors of the BDVA and European Programs Manager at Atos. Register now! Read more about New BDVe series webinar: How much do you know about the European Strategy on Big Data? EBDVF 2019: become a sponsor! The European Big Data Value Forum 2019 (14-16 October, Helsinki) is now open to different available options to sponsor the event. Interested organizations can choose among four different sponsorship packages (Diamond, Platinum, Gold, Silver, sponsoring coffee breaks or customized package). Read more about EBDVF 2019: become a sponsor! The awaited DatSci & AI Awards competition is open! Individuals and teams working within the Data Science Ecosystem from across Europe can apply in 10 different award categories. Big Policy Canvas (BPC) is organsing a webinar on April 9 (14:00 - 15:00) under the theme "Big Policy Canvas Knowledge Base & Assesment Framework".